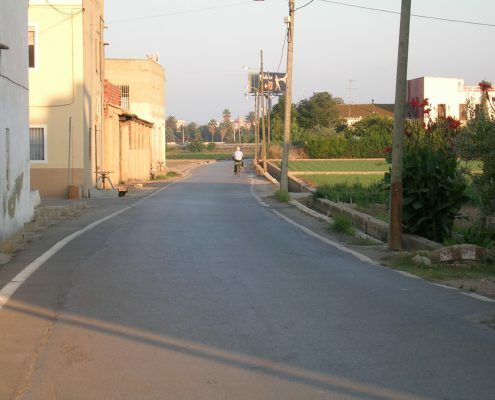 The Farinós Road (el Camino de Farinós) connected Benimaclet with Malvarrosa across the farm land between them. 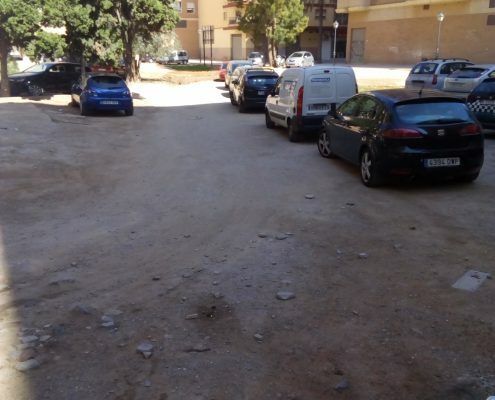 Since it zigzagged a lot, the road went in and out of the Alboraia and Valencia municipalities. 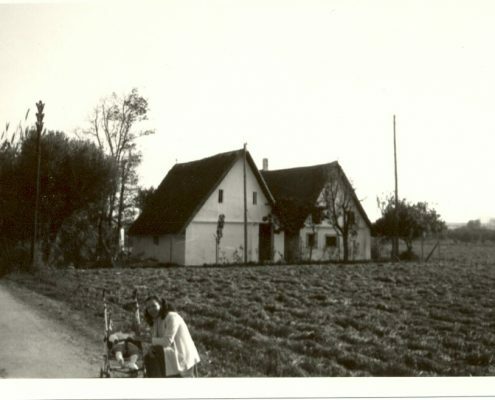 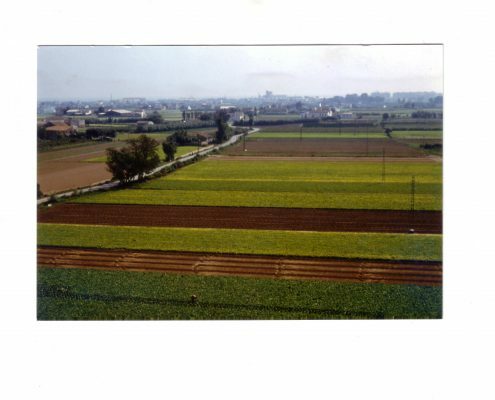 But as we will see, it was always surrounded by farm houses and cultivated land. 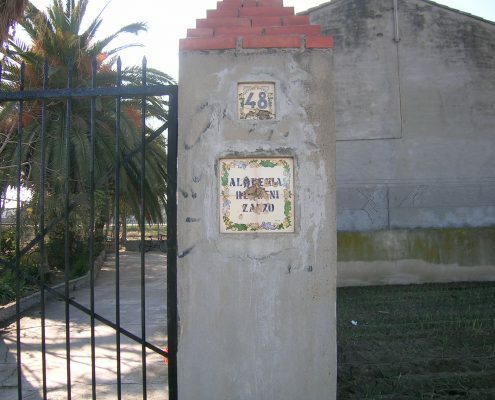 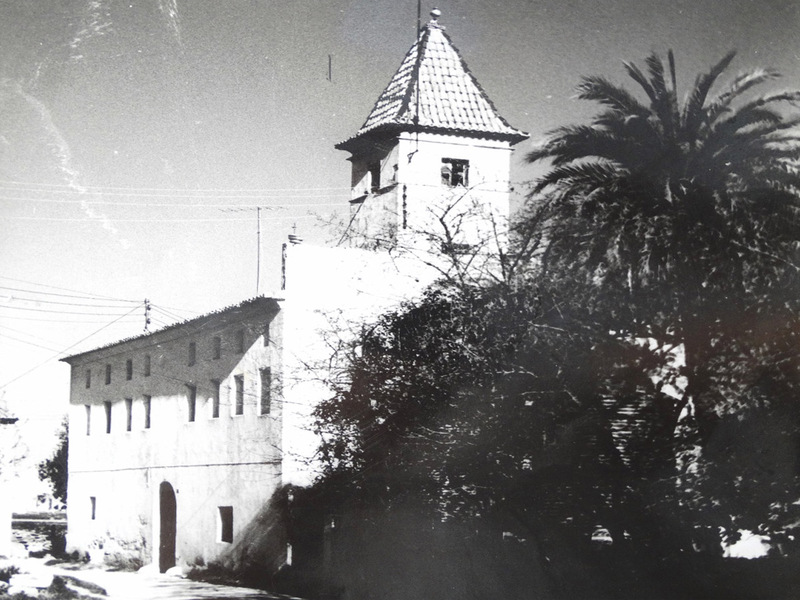 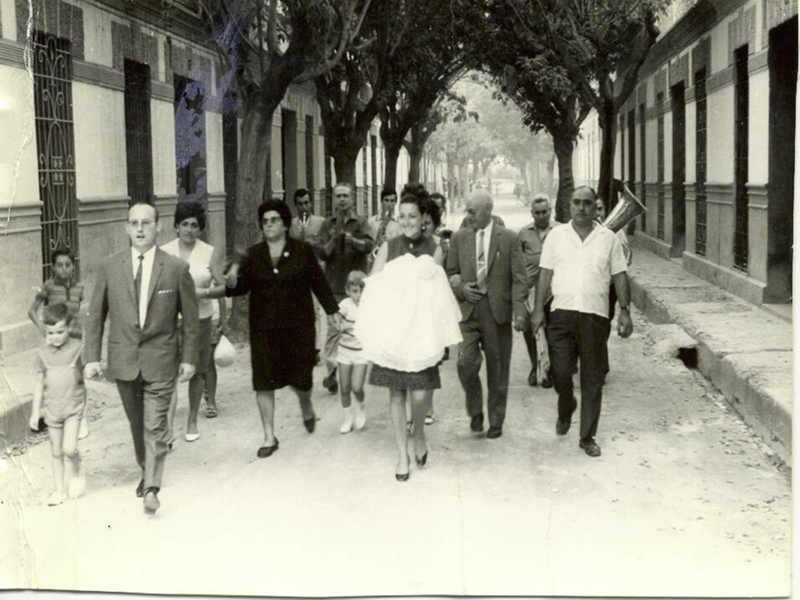 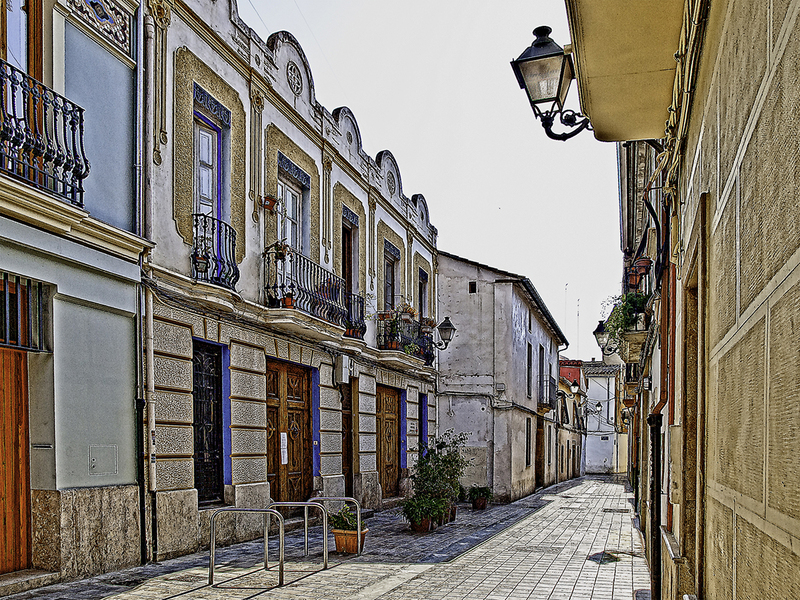 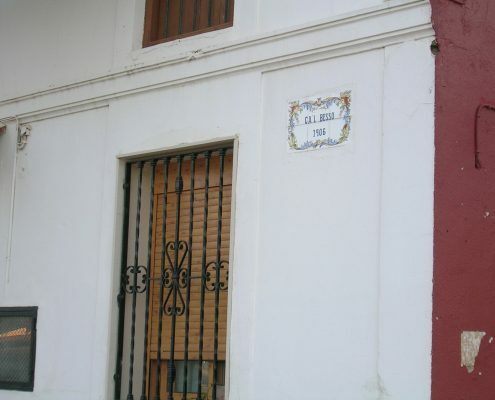 Its origin was the New Alboraia Road (el Camino Nuevo de Alboraia), which is now Emilio Baró Street, near Francisco Martinez Street. 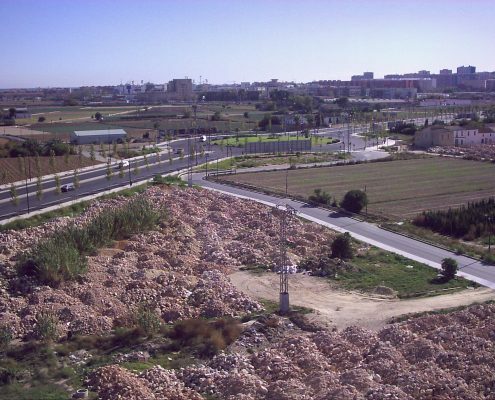 After the construction of the buildings of the 1970s, the road began instead at Valladolid Avenue. 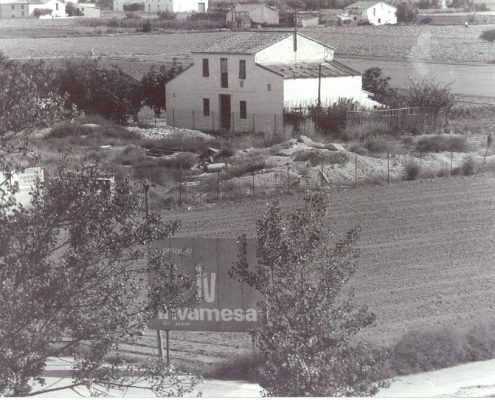 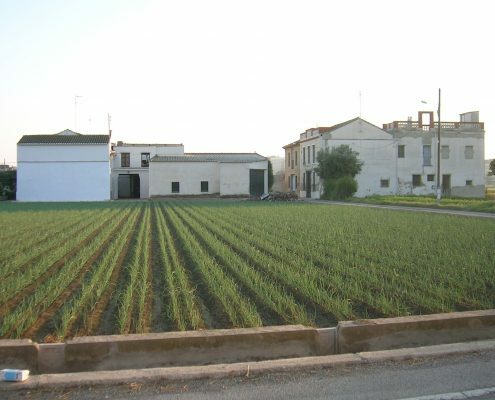 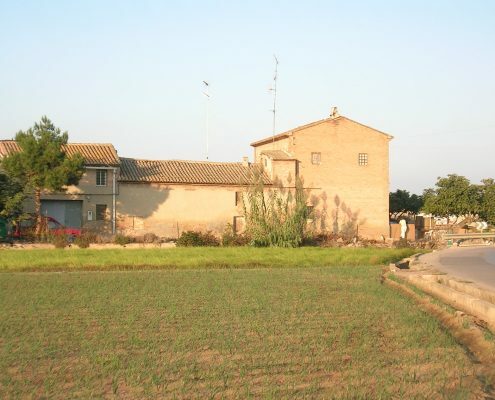 At this spot, near Valladolid Avenue, it was only a few meters away from “La Alquería de El Saco” (The Saco farmhouse), and from “el Matadero de Benimaclet” (the Benimaclet slaughterhouse), and a small road on its left led us to the farmhouses “Casa del Pepino”, “Casa de Chiner”, “Casa del Tío Ramonet”, “El de Valls” and “Casa de El Esgarrat”, all in the vicinity of what is today the Sagrada Familia school. 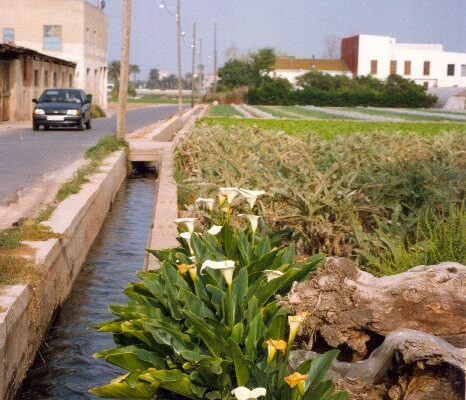 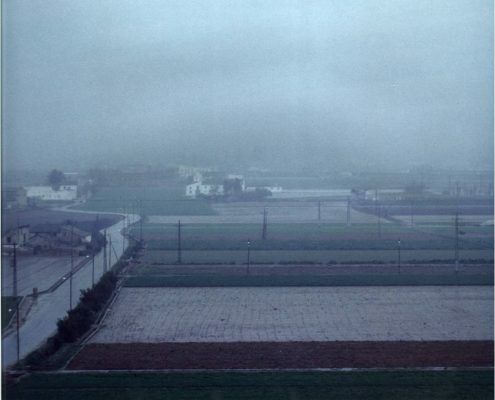 And on both sides of the road there were irrigation canals. 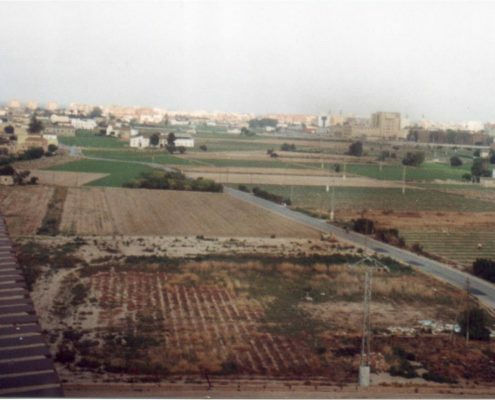 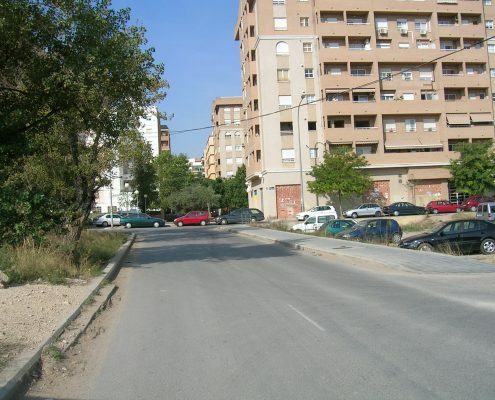 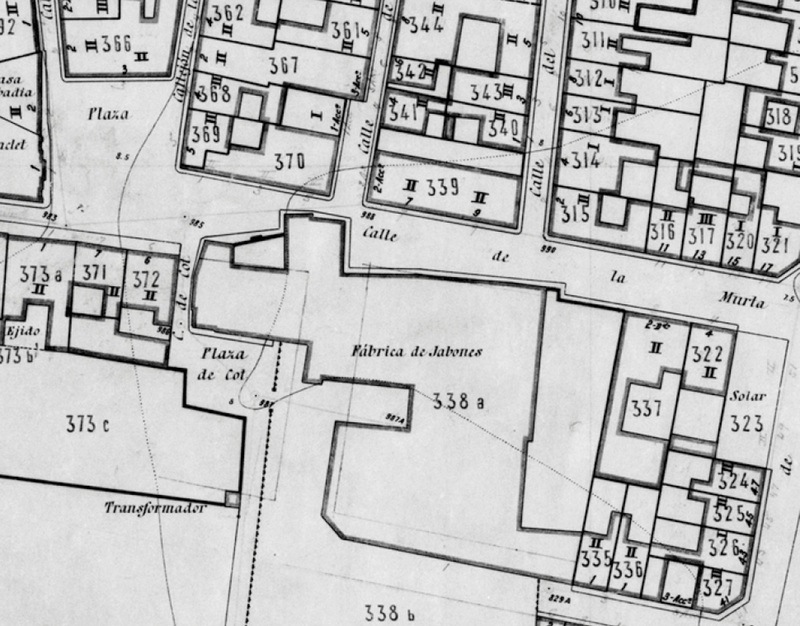 After some 200 meters, the road passed by the “Alquería des Barbes” that has since disappeared. 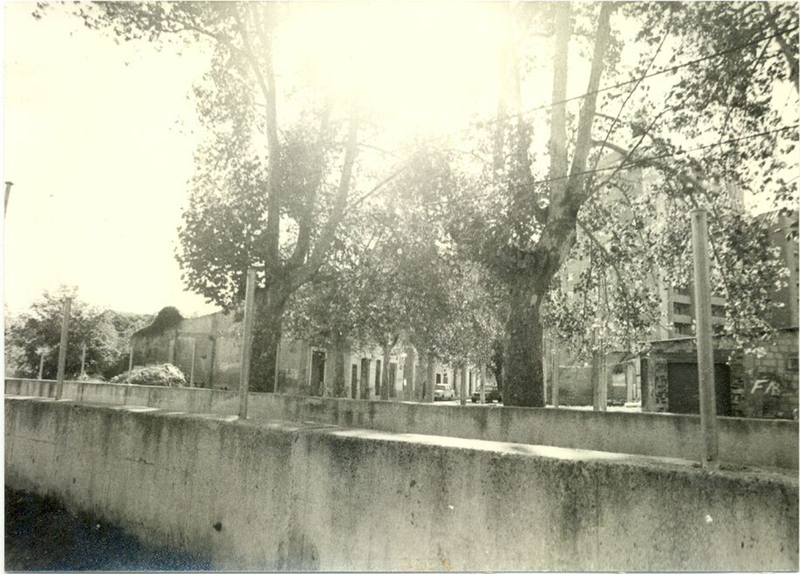 And across from it, approximately, stood “Les Barraques de El Gangós”. 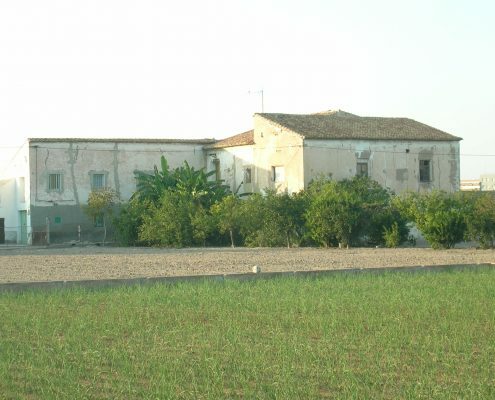 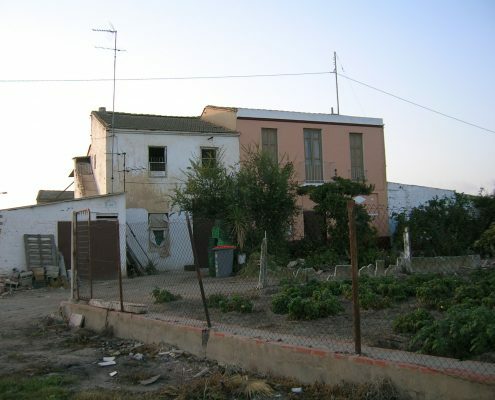 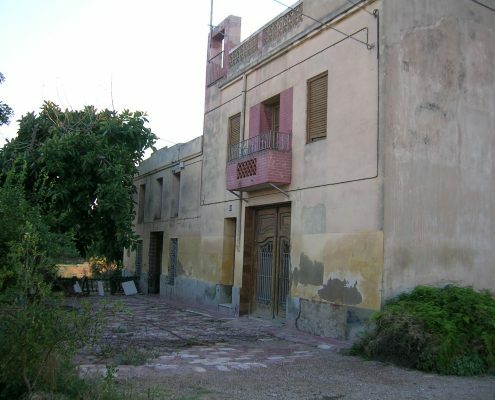 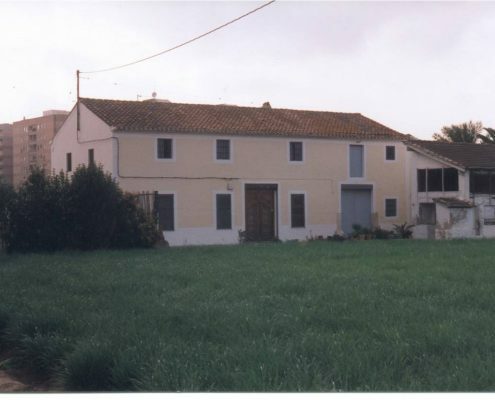 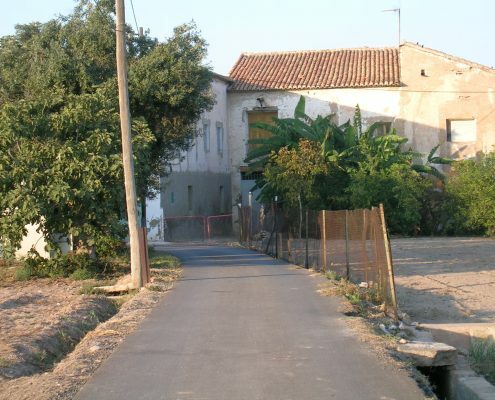 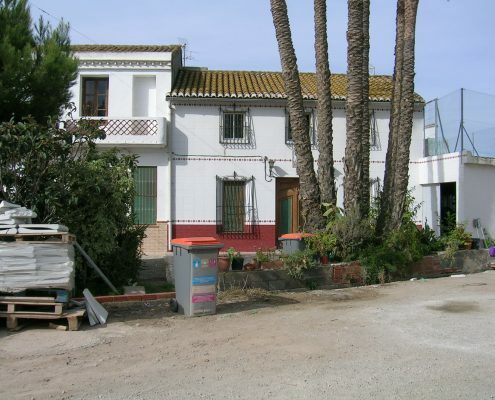 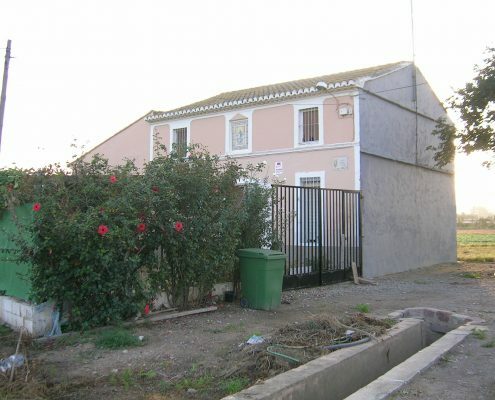 A bit further on there was an old house that used to belong to “El Tío Tabal”, and a path that ended at “Casa Collons”. 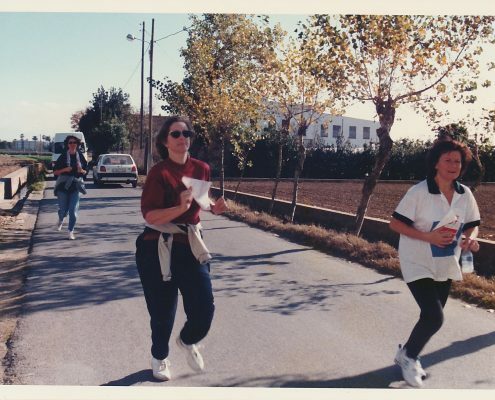 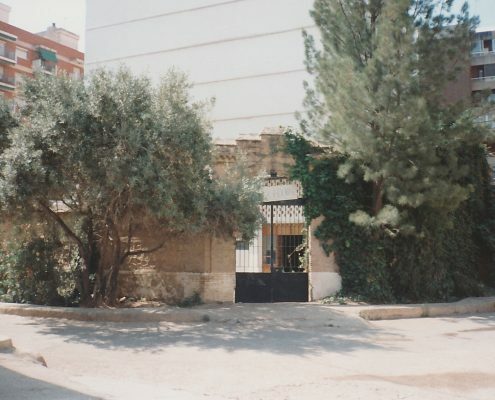 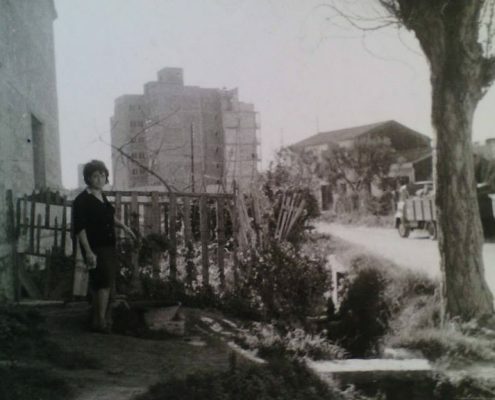 If we continue along the road, there was another path to the right that would lead us to “Casa Bonora”, “Casa Lillo”, and to “Casa del Tío Bayarri”, and nearby was “Casa Patac”, which has now been transformed into urban gardens run by the Benimaclet Neighbourhood Association. 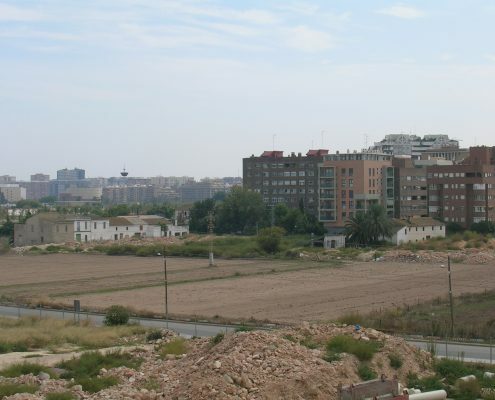 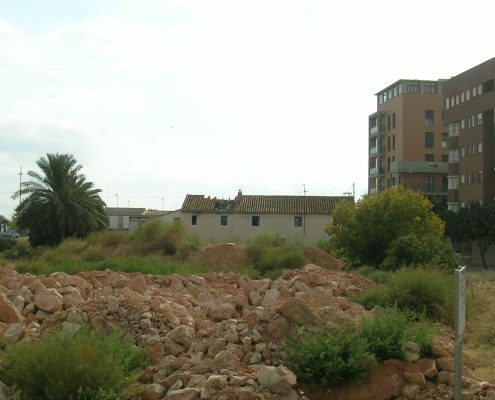 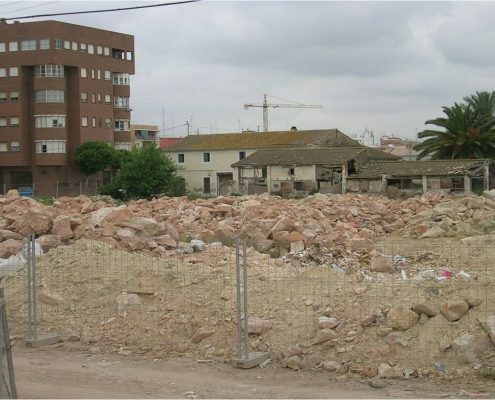 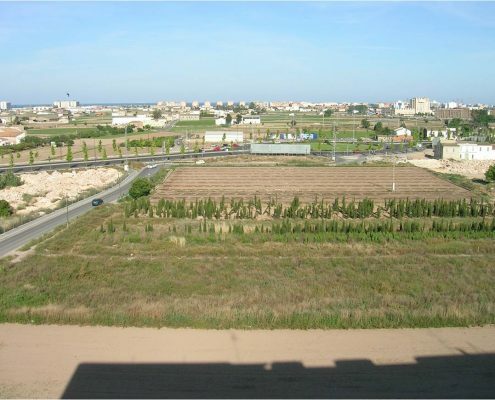 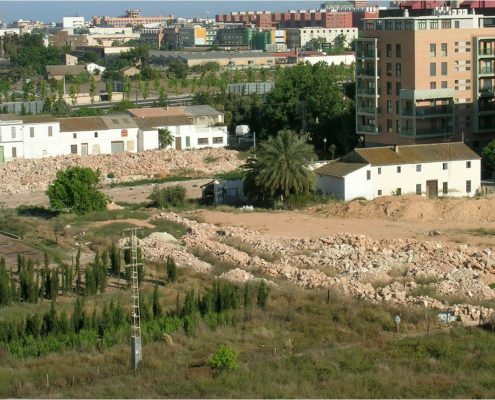 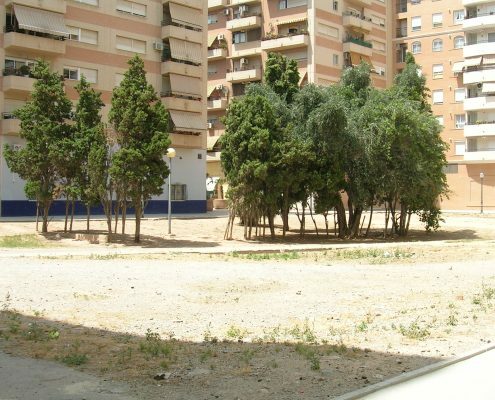 The urban development plan “PAI Benimaclet Este” has not yet been realized. 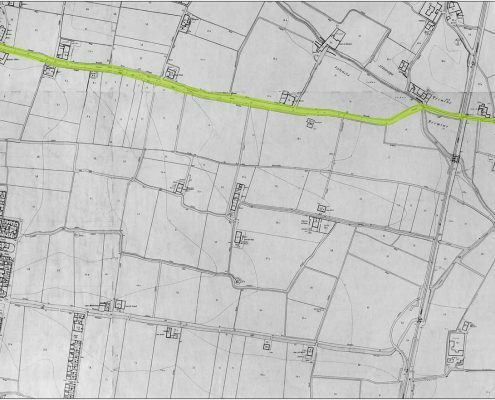 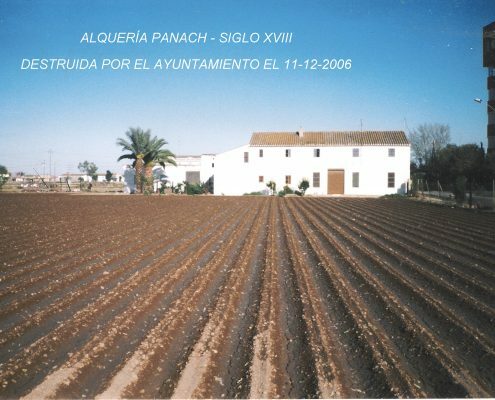 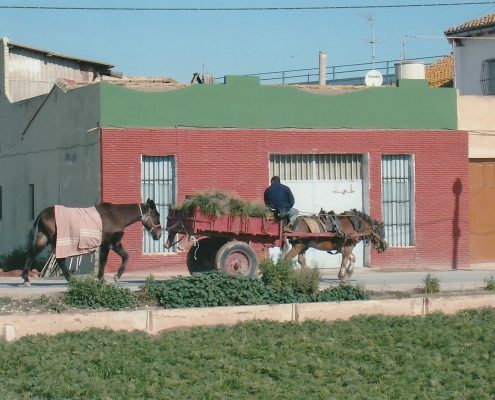 Nevertheless, along with the construction of the Ronda Norte highway, it contributed to the destruction of a large portion of Benimaclet farm land and to a brutal interruption of the Farinós Road. 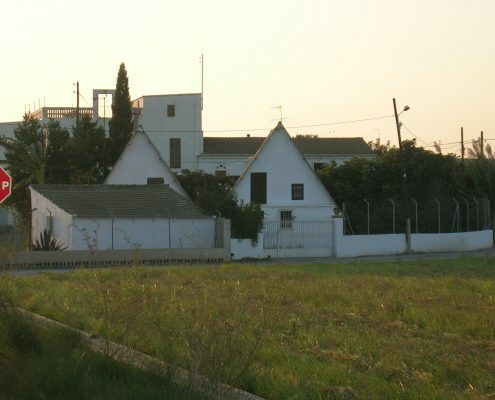 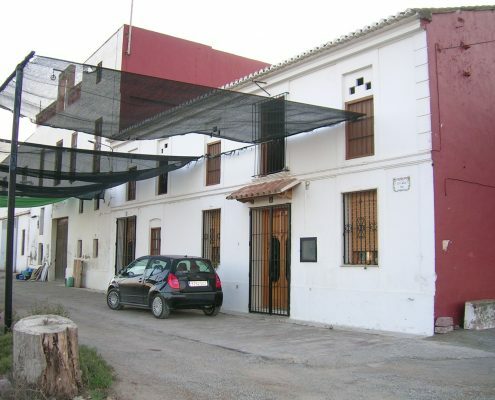 As things are now, after crossing Ronda Norte, we find to our left the mill “El Molí Nou”, also known as “Molí de Farinós”, and to our right “Casa Zarzo”. 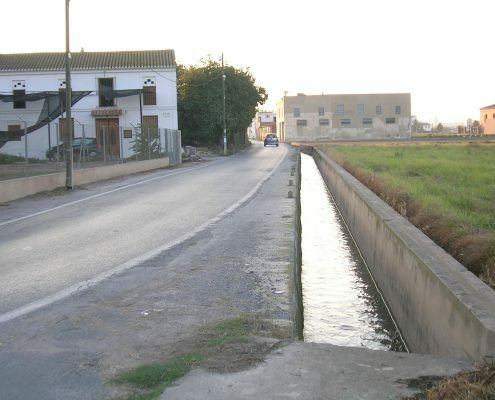 As we continue along the road, after crossing the irrigation canal “acequia de Vera”, we find what is popularly known as “Casa de El Pont de Pedra” (the house of the stone bridge), and right away we cross the bicycle path that connects Valencia with Meliana and other villages of Huerta Norte (the farming area north of the city). 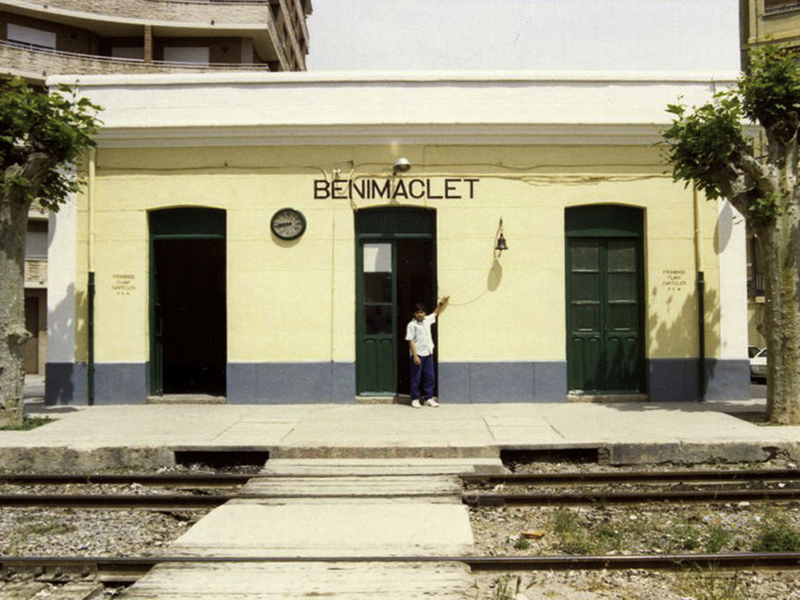 This was where the train from Valencia to Aragón used to run. 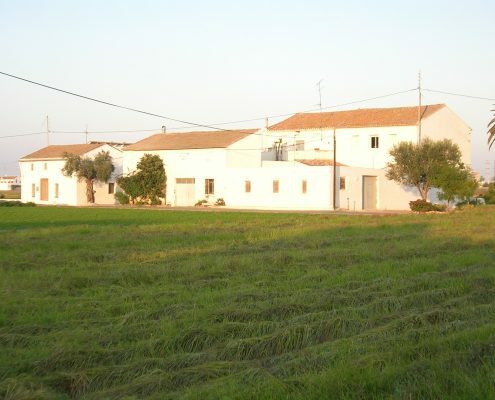 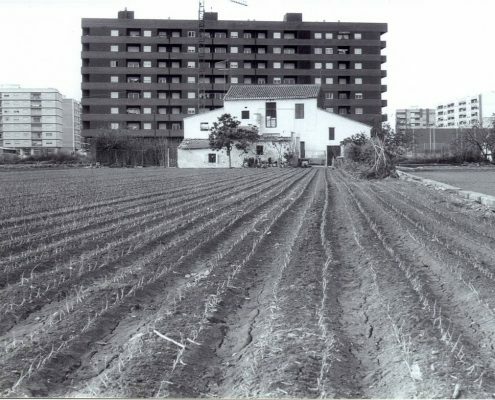 Immediately after the bicycle path we will see various farm houses surrounded by the only cultivated pieces of land left in Benimaclet of what used to be this large and productive garden area. 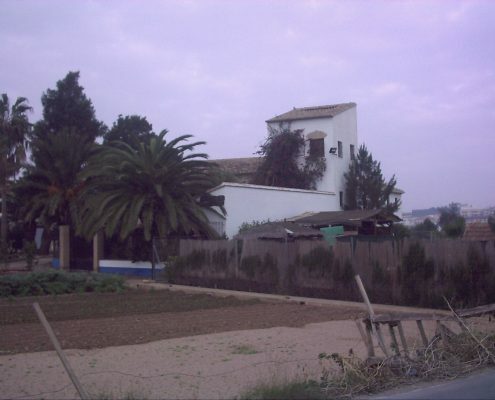 This is where we find “Casa dels Peris”, “Casa de El Figuero y Tomás Sancho”, “Casa Blaya”, “Casa Coret”, “Casa Valero”, “Casa dels Monsonis”, “Casa Garra”, “Ca Bessó”, “Casa del Senyoret”, “Casa Xurret”, ”Casa Grande”, “Casa Blayet” and “Casa dels Chiners”. 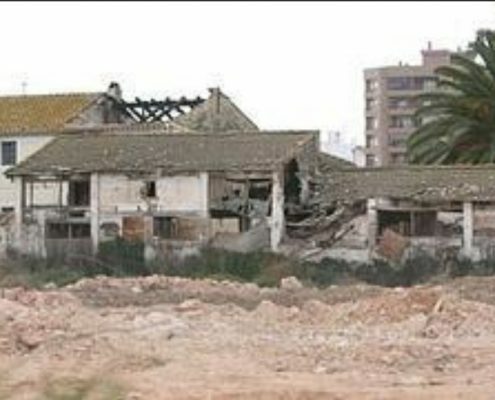 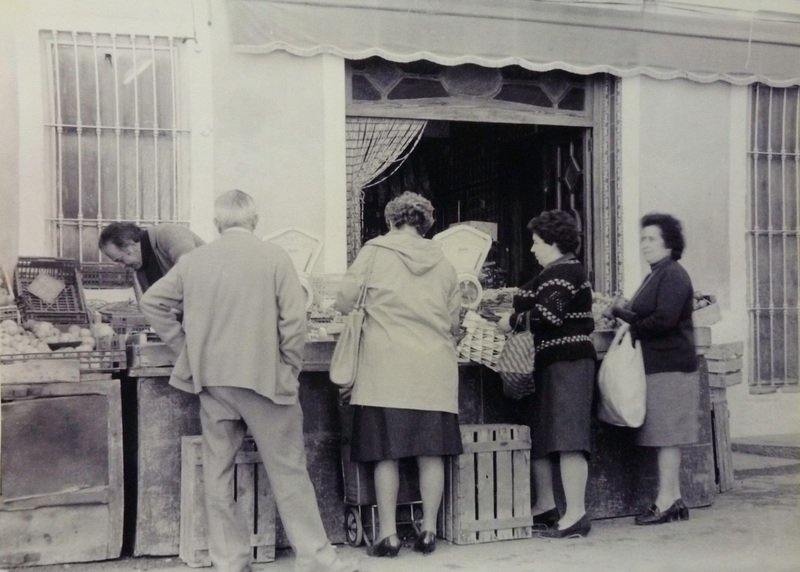 A little further on we see “Las Casas de Hueres”, “Casa dels Besons” (which used to be a shop). 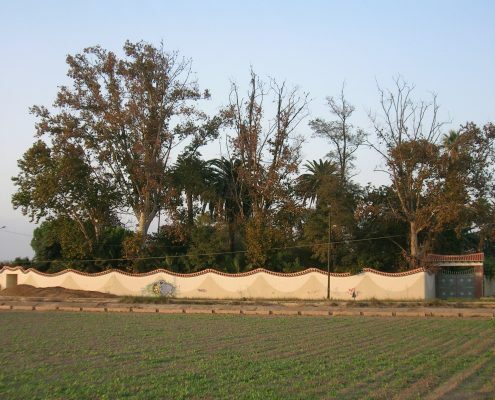 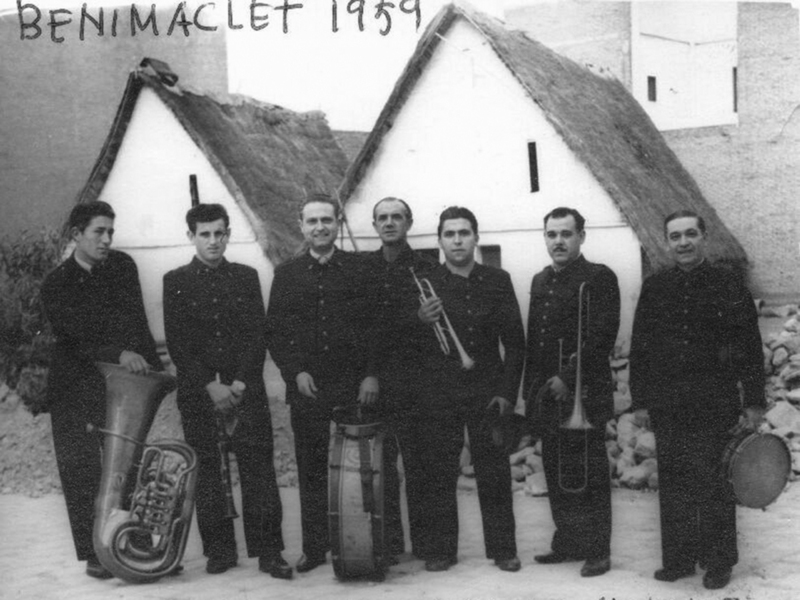 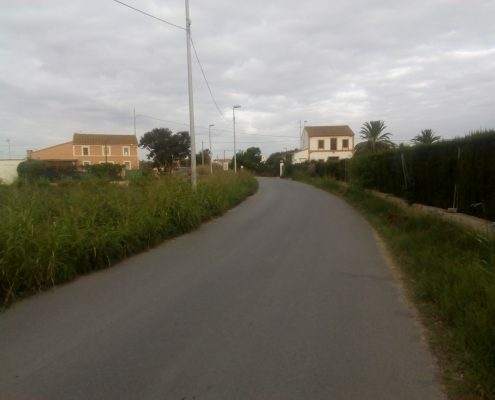 And soon after that, “Les Barraques y la Casa de Caldera”, and across from them a narrow road leading to the houses “Bolea”, “Marins” and “El Amo”. 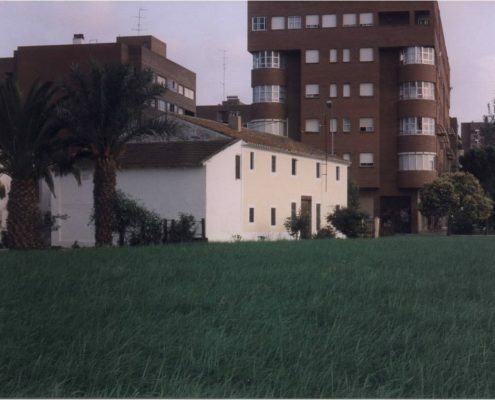 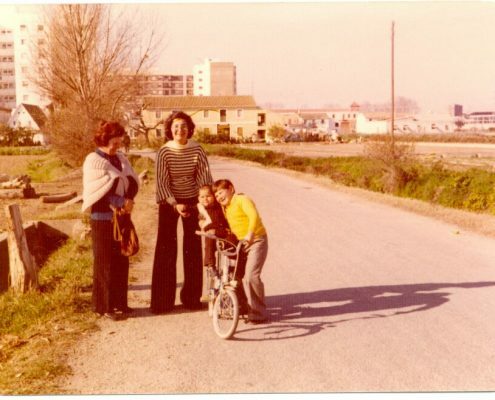 By what is today the expressway to Barcelona the “Casa de Lleo” used to stand, and further on the houses of “Pere”, “Martí” and “Paco el Coixo”. 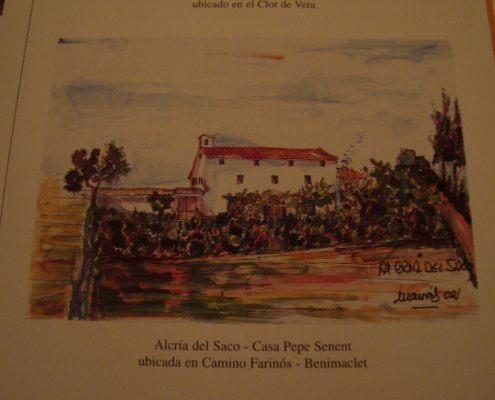 Soon after passing the expressway, through a small tunnel, we find at our right the area of “La Ermita y Molino de Vera” (the Vera chapel and mill), and the restaurant “Famós”, along with a famous spring known as “El Clot de Vera” (the Vera Hollow). 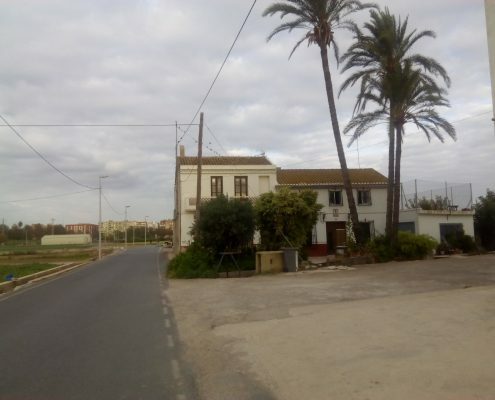 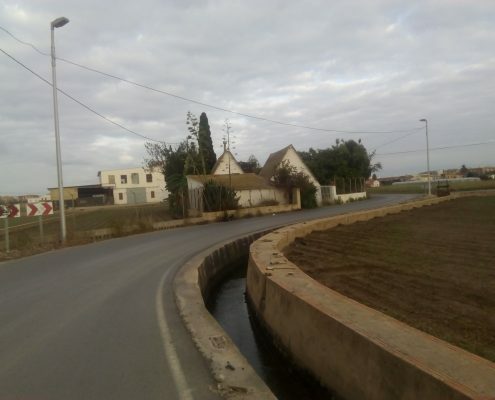 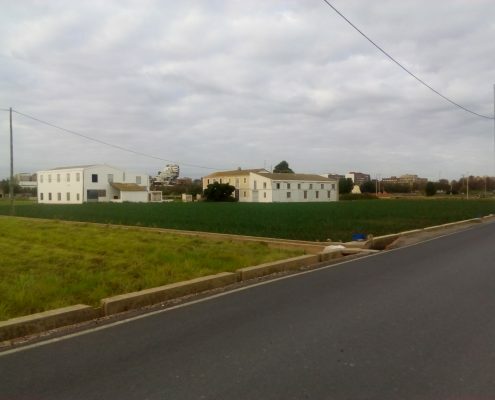 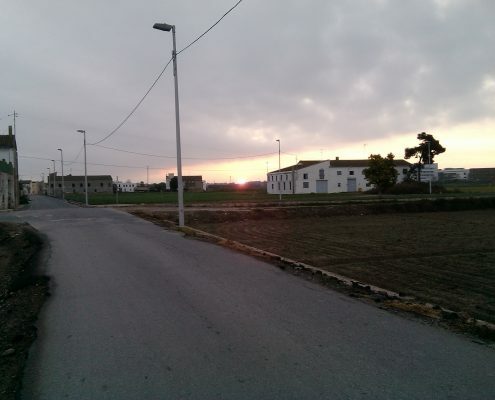 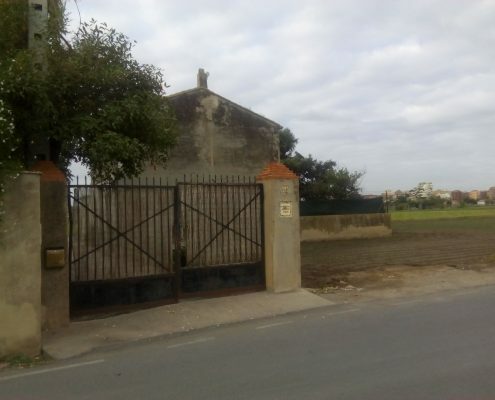 We are now close to the end of the Farinós Road, before it merges with another road coming from Alboraia, but we can still observe the houses “Del Porrut”, “Del Borriquillo”, “La de Alcorisa”, “La de Tollina”, ”La de Marc”, “La del Vicari”, ”La del Forner”, and “La del Marro”.